Seasons greetings to all of our Link Ethiopia supporters, whether you are attached to one of our growing number of linked schools, whether you are one of our project sponsors or donors, whether you support a child and its community through Link Ethiopia, or whether you just show an occasional interest in what we are up to. Whoever you are, wherever you may be, all the Link Ethiopia team hope that you will enjoy a peaceful and amicable Christmas season! We all know that Ethiopia is the home of coffee, and that some of the finest coffees in the world still come from that country. But you may not know about the much more recent development of floriculture in Ethiopia. In recent months, dozens of private flower farms have been springing up across the country. Greenhouses for the culture of roses now line roads where the land was barren just a few years ago. Growers from many countries have arrived in Ethiopia to make this new industry a very positive economic boost to Ethiopia, not only in terms of national revenue, but in the provision of hundreds of new jobs for Ethiopian workers. Let’s hope some Christmas Roses are amongst their products! On a somewhat different subject, news arrives to tell us that Nokia has devised a method to allow Amharic speakers to text each other on their mobile phones! The 300 different characters of the Amharic alphabet provided something of a challenge for Nokia, but it now appears that the problem has been cracked. Nevertheless I’m sure that many Ethiopians will hang on tightly to the much more personal activity of having a good and thorough chat with their neighbours! 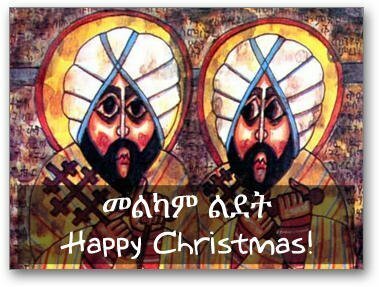 Ethiopian Christmas is known as Ganna and is celebrated on 7th of January. Christmas celebrations take place both in ancient churches carved from solid volcanic rock and modern churches designed in three concentric circles. Men and boys are made to sit separately from girls and women and the choir sings from the outside circle. Candles are given to people as they enter the church. They light the candles, then walk three times around the church and stand throughout the mass, which may take as long as three hours. Traditional Christmas dishes includes injera, a sourdough pancake like bread, which serves as both plate and fork along with doro wat, a spicy chicken stew served in ornamented baskets. 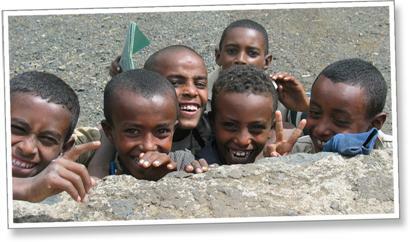 Giving gifts is not a big deal in Ethiopia and children usually receive clothes as presents. On Christmas Eve, people remain outdoors and pray and chant all night. In the morning, a colourful procession marches to the nearby hilltop headed by three young men with whips to keep everybody in line, where a service is held. After the prayers, priests bless the bread and wine and distribute it to everybody. People dance, play games and feast for the rest of the day. We very much hope that you’ve enjoyed reading our News Updates this year, and we intend to continue to keep you up to date with all of our goings-on at Link Ethiopia. .
As our UK New Year is about to dawn (Ethiopia’s is in September, as I’m sure you already know), I would like to invite all of you to get even more involved in supporting our work, whether in large or small ways. If we are to continue to help the schools and communities in Ethiopia in really meaningful ways, we need you to help us with a little finance, if you can and will. Our website will tell you all the ways in which you might do this – anything from sponsoring a complete project in your own name (or indeed in that of one of your family or friends) to simply giving us an untied donation of any amount via the website. However you can help us, I give you my personal assurance that we will use every penny or cent in the best way possible to help education in Ethiopia. Best wishes to you from the ever enthusiastic and hard-working Link Ethiopia team in both countries. Wikitravel’s news and views on travelling in Ethiopia at http://wikitravel.org/en/ethiopia. As always, if anyone reading this would like to offer us expertise, knowledge and help with our work or would like to associate yourself with one of our school projects (classrooms, water, toilets, books, etc) then please get in touch. You can donate via the following link, or by contacting us – details at the bottom of this page.